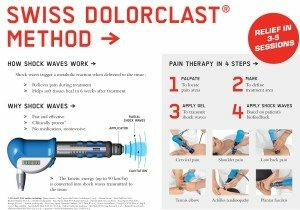 Shockwave therapy involves the delivery of high intensity soundwaves from a handheld device which penetrate into the underlying tissues, which is thought to increase blood flow and stimulate tissue repair. There is usually some immediate relief following the initial treatment. The research suggests that 3-5 treatments conducted once a week to achieve significant decrease in pain. Our Physiotherapists will combine Shockwave therapy with other treatments and targeted exercise to achieve the best results!